I can’t really decide which is the number one handset in the month of October 2011. Though Apple iPhone 4S made a record of first 4 day sales, but it seems that Samsung made Google Galaxy Nexus caught the entire spotlight from its 1st day of appearance. Everyone around the globe is interested to know its price and release date because of the presence of Android 4.0 Ice Cream Sandwich inside. After 10 days of the official announcement, Samsung today announced the European roll out plan for Samsung Galaxy Nexus at the Battersea PowerStation in London. Release date for Samsung Galaxy Note is also announced. It will begin its roll-out on November 17 in Europe and then move on to global availability. You can already place your order for unlocked SIM free version at Amazon UK anywhere from United Kingdom. 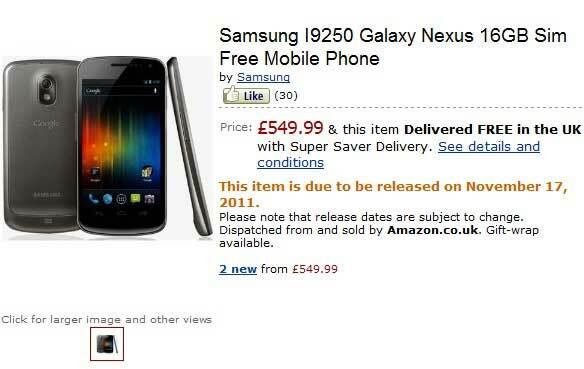 Price of SIM free version of Samsung Galaxy Nexus is £549.99 ($885). You can get your copy of Galaxy Nexus without any cost for delivery inside UK. If you don't like to spend too much at the beginning then you can always sign-up for a subsidized handset on Vodafone, O2 and 3UK -- its intended HSPA+ carrier homes. Check out the carrier website for details including contract price and release dates other Samsung mobile phones.